Easter just isn’t Easter without a suitable bake. And as far as I’m concerned it’s all the better for the inclusion of chocolate. So, with that in mind, I wish you all a very Happy chocolate filled Easter and hope you enjoy my Simnel Mincemeat Easter Cake with chocolate apostles. We’re just off to my mother’s for lunch which will be followed later by an Easter tea. She normally makes a traditional simnel cake which is always moist, almondy and delicious. This year she didn’t manage to make one, so I’ve jumped into the break. Guests will be partaking of my Easter cake instead. Due to the short notice, I made it with mincemeat. I’ve used mincemeat to make light fruitcakes with great effect before, so I knew it would work, as evidenced by my figgy almond and whisky cake and fig and mincemeat cake. Although Christmas was a few months ago now, I had a surprise delivery of Dr Oetker chocolate the other day. With a box so generous it was hard to lift, I knew whatever cake I made, it would have to feature chocolate. I reckoned chocolate truffles flavoured with Amaretto would make a nice change from the usual marzipan balls which represent the eleven apostles; the twelfth apostle Judas is traditionally banished for having been a naughty boy. I made plenty more than eleven so I had homemade truffles to gift to my Mother and CT for Easter; the odd one might have made its way to me too – I call it commission. Dr Oetker is a German company that produces an extensive range of cooking and baking products that are widely available in UK supermarkets. They have a good selection of chocolate suitable for use in baking: 26% white chocolate, 35% milk chocolate, 72% dark chocolate and a wonderfully dark 90% chocolate. I also used their baking powder, cocoa powder and marzipan in my Easter cake as I happened to have these in the house. Simnel Easter Cake. PIN IT. Thanks for visiting Tin and Thyme. 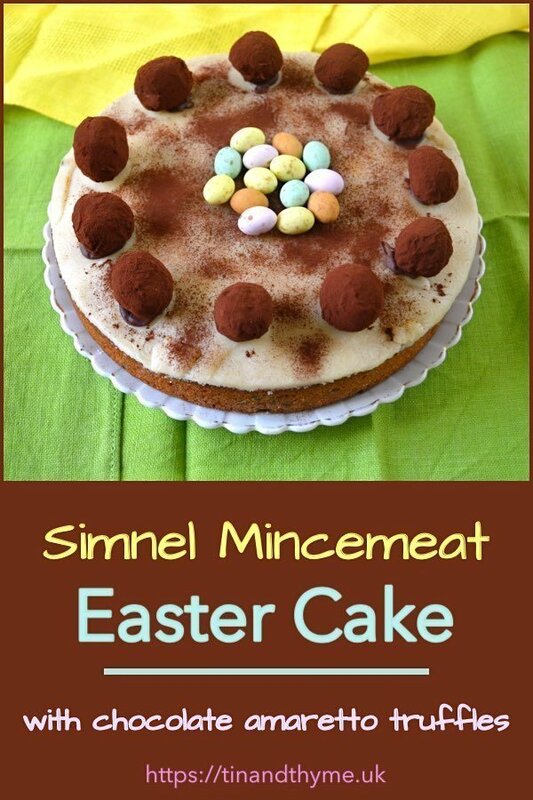 If you make this Simnel Mincemeat Easter Cake, I’d love to hear about it in the comments below or via social media. Do share photos on your preferred social media site and use the hashtag #tinandthyme, so I can spot them. For more delicious and nutritious recipes, follow me on Twitter, Facebook, Instagram or Pinterest. A simple but effective simnel cake flavoured with Amaretto and using mincemeat for the fruit and nut element. This can easily be made at the last minute, although it will also keep for a couple of weeks. Decorated here with chocolate Amaretto truffles instead of marzipan balls. Sift in the flour and baking powder. Stir until just combined. Add the mincemeat and stir. Add the ground almonds and stir, followed by the Amaretto until just combined. Spoon the batter into a buttered 23cm (9") silicone mould or lined tin. Bake at 170°C for about 45 minutes or until the cake is well risen and an inserted skewer comes out clean. Allow to cool for 10 minutes, then turn out onto a wire rack to cool completely. Roll the marzipan out to a size to cover the top of the cake. Place on top and trim the edges. Place under a hot grill to bronze the marzipan a little or use a chef's blow torch - be careful as it can burn very easily. Place the chocolate into a heat proof bowl. Bring the double cream to a near boil and pour over the chocolate. Leave to stand for a few minutes. Stir from the centre outwards until everything is melted, smooth and amalgamated. If the chocolate doesn't quite melt, place the bowl over a pan of hot water and continue to stir until just melted. Leave the ganache to set in a cool place for a couple of hours or so. Take walnut size balls of the ganache and roll in the cocoa powder. I did this between the palms of my hands, but it's a messy business and a melon baller or similar gadget might be a wiser choice. I made 30, but some of mine were a little on the generous side. For a deeper cake use a 20cm (8") and bake for 10-15 minutes longer. For a more traditional simnel cake, use a smaller tin as above. Spoon half of the batter into the tin, add a layer of marzipan, then place the rest on top. Decorate with 11 marzipan balls. Ganache makes between 30 and 36 truffles. I’m sending this Easter cake to Casa Costello and Maison Cupcake for Bake of the Week. Thanks to Dr Oetker for the chocolate. I received no other remuneration for the post. I was not asked to write a positive review and all opinions are, as always, my own. Thanks to my readers for supporting the brands and organisations that help to keep Tin and Thyme blithe and blogging. Happy Easter ! You’ve made a really nice cake Choclette. It looks delicious. Just one question: how much – in grams – is a jar of mincemeat ? Happy Easter Henk. Back from lunch and tea and I very much do feel like a stuffed chocolate truffle now. The cake was really good and everyone seemed to enjoy it. I didn’t know how much the mincemeat weighed as it was in an odd shaped jar, hence measuring it in tbsp, but I’d estimate between 300g and 400g. Thanks Sarah, it was really good and everyone enjoyed it. I am failing in my cake making (and therefore, as a consequence) in my cake eating! I love this, and of course, chocolate truffles help! What a great take on a Simnel cake and chocolate truffle apostles are just brilliant. I still have marzipan so may make another Simnel cake soon. Thanks for sharing my Simnel cake slice recipe. Thanks Janice. Truffles and simnel cake went down very well this afternoon and no-one had a go at me for not sticking to tradition – phew! Happy Easter! This cake is beautiful and I love how you decorated it with truffles yum! A Simnel Cake is up there on my list of things I really must bake one day. It’s going to have to wait until next Easter though. If you like marzipan, it’s well worth doing. A good simnel cake is one of my all time favourites. I have always wanted to bake a simnel cake – had a slice this easter at a cafe where they had 11 balls around the edge and one in the middle which I thought was not quite right. But it was good to taste it. I still have mincemeat at home and been wandering how to use it – this looks like an excellent way. Hope you had a great easter lunch. I really like your truffle apostles. Simnel cakes are one of my absolute favourites, although they’re not much good if you don’t like marzipan. Maybe the cafe felt sorry for judas, so placed him in the middle, sort of with the other apostles and sort of apart. The truffles were definitely the stare of the show, although everyone enjoyed the cake too – it’s a good cake. Nice variation! I would never eat a big ball of marzipan….but a truffle? Now you’re talking! Sadly CC (and I say this as I have little self-control), I would happily eat both. What a clever idea using mincemeat to speed things up a bit! Also love the idea of putting chocolate truffles on top. that does look suitably Easter doesn’t it? Do you feel better now you’ve done a few bakes? Love the truffle eggs too, they look amazing! Yes, definitely needed to get a bit of baking done – all down to your killer brownies Dom. The truffles are fab. I made plenty, so we still have one or two left to devour. So very festive and beautiful! I love esp. those homemade truffles. Thank you very much QB, that’s kind of you to let me know. Great tip to use mincemeat when you need a speedy cake (although I have still got some emergency fruit soaking from Christmas!) Love the idea of the Amaretto chocolate balls too. Thanks so much for joining in with #BakeoftheWeek again. Haha Helen, you should be well and truly set up for next Christmas now. The Amaretto apostles were delicious and luckily I made extra, so there are still one or two to be had. I love everything you have going on here! I am such a marzipan fan and better still with added chocolate! Thanks for joining in with #BAKEoftheWEEK ! Thanks Sarah. The only thing to improve on with this cake is to add the layer of marzipan in the middle – then it would be perfection. Anything chocolate gets my vote! I’ve never heard of simnel cake before, but you’ve convinced me I need to try it. Those chocolate bars looks like heaven! If you like marzipan, simnel cake is for you. It’s best really with a layer of marzipan baked into the middle which gives you two different textures as well as double the marzipan. I’ve never been a fan of marzipan so I LOVE the idea of using Amaretto truffles instead! This looks fab. 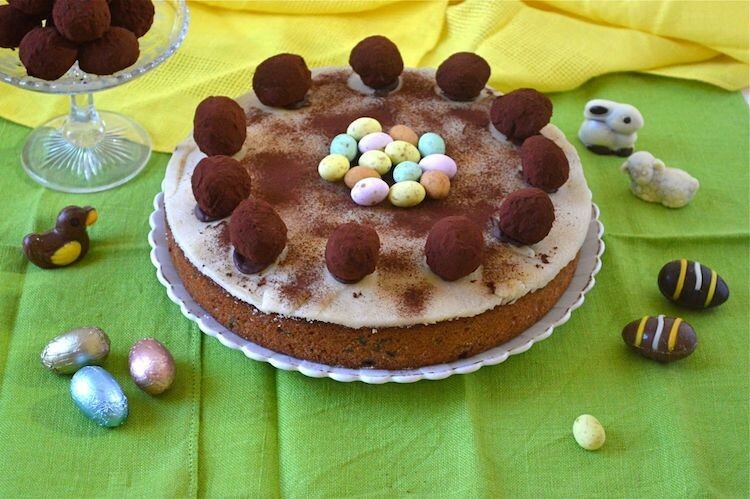 What a great idea to use mincemeat in a simnel cake – like a mashup of holidays. The truffles are so lovely on it, too! Haha, yes, very true. I was really pleased with the truffle idea. Wow, you always make the most wonderful cakes Choclette. This one is no exception. Now pass me a slice!